None of that, however, means that Inherit the Wind was the first theatrical treatment of the Scopes trial, although it may have been the first full-length play about the trial. 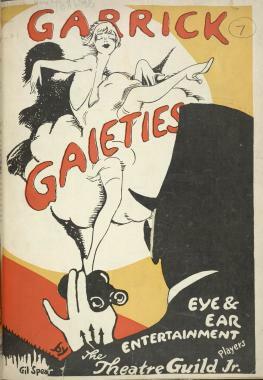 And thereby hangs a tale…about “And Thereby Hangs a Tail”—a sketch based on the Scopes trial that appeared in The Garrick Gaieties, a revue that originally ran in 1925. The revue is remembered primarily as the first major production of Richard Rodgers (music) and Lorenz Hart (lyrics); its most famous song, now a standard, was “Manhattan” (“We’ll have Manhattan, / The Bronx and Staten / Island too”). The first of what were planned to be two performances was on May 17, 1925. The revue was so well received by the public and the press, though, that the run was extended on June 8, 1925, with a variety of changes. Among the changes was the insertion at the beginning of the second act of “And Thereby Hangs a Tail,” with lyrics by Hart and libretto by Morris Ryskind (1895–1985) and the revue’s director Philip Loeb (1891–1955). The lyrics to “And Thereby Hangs a Tail” are not hard to find. They appear, for example, in The Complete Lyrics of Lorenz Hart (expanded edition, 1995). The libretto, however, was elusive. Ryskind was a prolific writer, who wrote the screenplays for The Cocoanuts (1929), Animal Crackers (1930), and A Night at the Opera (1935), all successful vehicles for the Marx Brothers; was nominated for Best Writing (Screenplay) Academy Awards for My Man Godfrey (1936) and Stage Door (1937); and won a Pulitzer Prize for drama in 1932 for the musical Of Thee I Sing (with Ira Gershwin and George S. Kaufman). But I couldn’t find the libretto in anything he published. Loeb was better known for his acting (until he was blacklisted as a supposed Communist in the 1950s, leading to his suicide). Eventually, I managed to ascertain that the original libretto was housed at the Scherer Library of Musical Theatre at Goodspeed Musicals, the staff of which courteously and efficiently provided me with a photocopy. I am unable to reproduce the lyrics or the libretto in their entirety here, for copyright reasons, but I will give a blow-by-blow description, along with comments. The sketch takes place in a courtroom in the jungle—The Complete Lyrics specifies “an African courthouse”—and the characters are wearing monkey masks. The judge speaks, explaining that in the sensational case before him, “The defendant, Abbadaba Darwin, is charged with spreading the pernicious doctrine of evolution, which teaches that that stupid animal, man, is our grandchild.” The name “Abbadaba” is presumably intended to suggest reduplicative simian chattering, as in the 1914 song “The Aba Daba Honeymoon,” which I mentioned in the comments to “Fobbing Off Evolution” since Alabama’s governor Fob James alluded to the song while expressing his views about evolution in 1995. (Chris King provided a link to a recording at the Library of Congress.) The name “Darwin” requires no explanation, I trust! The crowd in the courtroom, including the jury, hiss their disdain, but the judge sententiously explains that the defendant, “no matter how vicious,” is entitled to a fair trial. The judge then directs the district attorney to present the prosecution’s case. The district attorney, in turn, explains that William Jennings Bryan will present the case: he is “outside waiting for the psychological moment to enter.” The moment about to arrive, the orchestra strikes up “Tammany”—presumably the 1905 song, of which there is a recording at the Library of Congress. “Tammany” was a strange, probably lazy, choice, doubtless selected to remind the audience that Bryan was a Democrat. But Bryan’s relationship with Tammany Hall was vexed. As Michael Kazin notes in A Godly Hero (2006), “After his dalliance with Boss Croker in 1900, Bryan routinely accused Tammany Hall and other urban machines of being tools of the trusts; not surprisingly, they returned his animosity.” What happens then? You’ll have to wait for part 2.